I really enjoyed Fantastic Beasts, and The Crimes of Grindelwald was a nice follow up that brought back some fun characters, continued the theme of fantastical creatures, and laid out a wizarding war with Grindelwald. It’s got good acting, good action, good visuals and a good story. It captures that magic of the Wizarding World but rather than focuses on a bunch of kids in school, it instead veers out as a Harry Potter film for adults. Not that the content in the film is too much for kids, but the story never feels dumbed down. The short and sweet, if you liked Fantastic Beasts, you’ll probably like this one too. Now there are some big spoilers in the movie as some big things go down. I won’t be diving into that territory as I don’t want to ruin anything for anyone. Suffice to say the wizarding war draw sides in this film as Grindelwald woos people over to his cause, and the Ministry of Magic does a terrible job of giving people a reason to trust them instead. It’s a fight to see if wizards should be allowed to rule the world of muggles rather than letting them sink the world into another world war. I have to give J.K. Rowling credit, she did a good job of giving Grindelwald the right amount of persuasive cause. As a viewer of the first film, you know he’s not someone to be trusted. He’s a bad guy. But in this film, you can see how he wins people over. That cause is further enforced by just how awful a job the Ministry of Magic is doing. The film shows just how murky and despicable they can be, slapping down restraints and death sentences without trial. It’s a dangerous world the wizards live in. You can see how they would be unhappy with the way things are. The road to war and sides, however, is one paved with love. Newt is chasing down Tina and Jacob is chasing down Queenie. Those romance subplots are deeply intertwined in the search for Credence, who Grindelwald is also looking for. Everyone wants Credence, alive or dead, as he is the key in wizarding war to come. You see, there’s this thing where Grindelwald and Dumbledore can’t fight each other. It’s a stalemate in the war. On one side, everyone wants Dumbledore to help them bring down Grindelwald. On the other side, they don’t have anyone who can go toe to toe with Dumbledore aside from Gindelwald, and he won’t do it. Thus there is a whole plot revolving around that situation, finding Credence, and breaking the stalemate. There are a lot of backstories that get investigated in the film as they play a part in the plot. This leads to some big reveals. I will admit, some of that felt a bit rushed, or needlessly complicated and shoved in, but some of it worked. Enough that it didn’t hurt the movie that much. 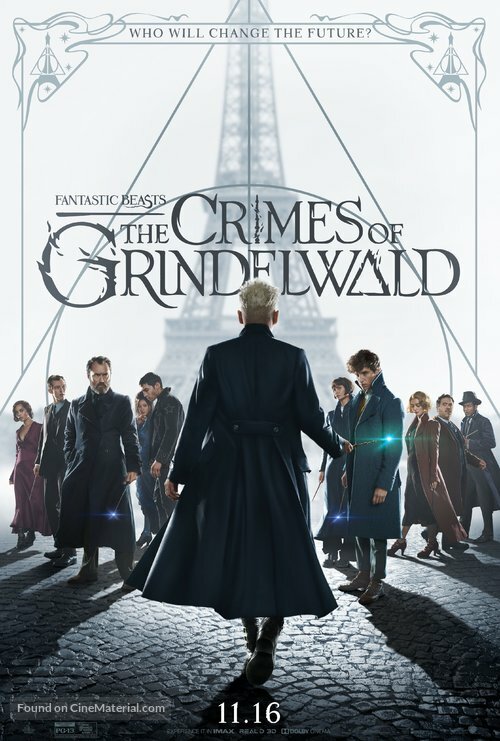 Toss in some fun creatures who are woven into the story without feeling forced, the endearing aspects of the love stories, and then tension as the wizarding war heats up, and you get a movie that is enjoyable and worthwhile. I certainly enjoyed it and I give it a four out of five metal bikinis.